The potential ranges of many species are shifting due to changing ecological conditions. Where populations become patchy towards the range edge, the realised distribution emerges from colonisation-persistence dynamics. 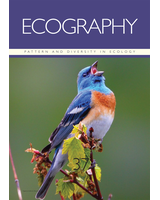 Therefore, a greater understanding of the drivers of these processes, and the spatial scales over which they operate, presents an opportunity to improve predictions of species range expansion under environmental change. Species reintroductions offer an ideal opportunity to investigate the drivers and spatial scale of colonisation dynamics at the range edge. To this effect, we performed and monitored experimental translocations of water voles to quantify how colonisation and local persistence were influenced by habitat quality and occupancy. We used a novel statistical method to simultaneously consider effects across a range of spatial scales. Densely occupied neighbourhoods were highly persistent and frequently colonised. Persistence was more likely in high quality habitat, whereas influence of habitat quality on colonisation was less clear. Colonisation of suitable habitat in distant, sparsely occupied areas was much less frequent than expected from the well documented high dispersal ability of the species. Persistence of these distant populations was also low, which we attribute to the absence of a rescue effect in sparsely populated neighbourhoods. Our results illustrate a mismatch between the spatial scales of colonisation dynamics in the core and edge of a species range, suggesting that recolonisation dynamics in established populations may be a poor predictor of colonisation dynamics at the range edge. Such a mismatch leads to predictions of long lags between the emergence and colonisation of new habitat, with detrimental consequences for a species realised distribution, conservation status and contribution to ecosystem function. Conservation translocations that also reinforce existing populations at the range edge might stimulate the rescue effect and mitigate lags in expansion.